For the last several months residents of Noel Avenue have been contacting the city via 311 about a utility pole. Despite months of calls the pole came crashing down damaging property. The utility pole had been sagging and the wires it supported were slowly dropping. It gotten so bad that neighbors would have to run outside every time someone heard a truck coming to make sure the truck didn’t hit the wires. The wires had dropped so low they even tried to prop up the wires with lumber to let trucks by. Last they we had the Fire Department come by to see if they could lift the wires but they couldn’t. Every call they made Con Ed and Verizon played the blame game. Con-ed said it was Verizons job…Verizon said it was Con Eds job. It all came crashing down when a Parks Department truck was driving down Noel with a large tree removal boom. The wires hooked onto the truck and then there was a huge shudder – as the wires snapped the pole like a twig. 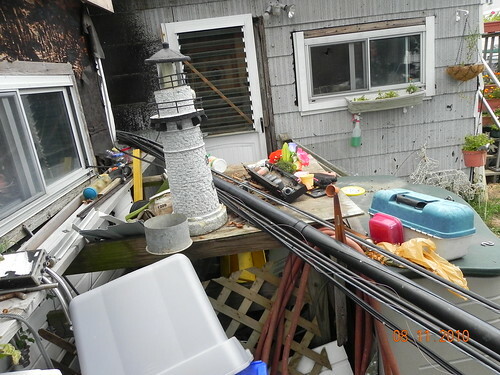 The the pole was ripped down as well as two electrical panels and the electrical conduit off two homes. There were large sparks which burnt siding. Both houses lost power immediately and had to use generators. No one was hurt and there were no structural fires – luckily. We blamed Con-Ed for not stepping in and preventing this! Scary, after the strong winds we had a while back the structural integrity of many of the utility poles around here need to be checked, as well as an inspection of any sagging lines. Sorry but they do not care about us at all, see we pay taxes and participate in our community. They will not help us until they have to, usually when it is to late. Wasn't there a flyer a few months back for residents to call a number to inspect the utility poles? Who's number was on that? Wouldn't that dept. be responsbile then? The flyer read/distributed at the GBPOA that month. What a shame, thank god the house didnt catch fire even more that no one was hurt, who takes care of the damaged property now? I certainly hope it isnt the home owners insurance, unreal I can only imagine ho wmany times the call was made too. Like anything else tho, never accept responsibility when you can blame someone else..There should be a call/report record each time it was made, Someones supervisor should be on the carpet answering some questions this week. God bless those involved and sorry for your damages, good luck. to Con Ed ( among the many made )and say to them I TOLD YOU SO!!!! 311 is a referral service only – they don't resolve any issues themselves. If anything, those futile calls to 311 will serve as evidence that the Departments involved were negligent. It is imperative that people call various city agencies via 311 so the individual agencies are not the only statistic keepers. The truck driver caused the damage, not Con Ed or anyone else. 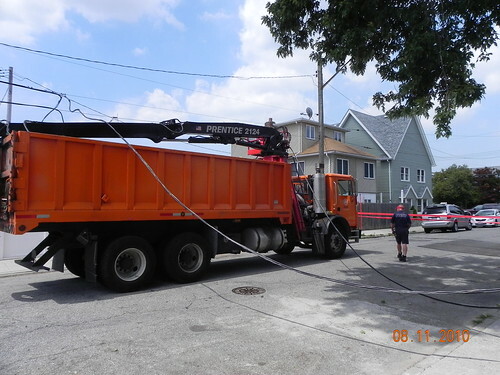 Yes Con Ed and the city knew of a promblem but the driver is the one who failed to properly operate his very large truck then ripped down the wires and pulled it with such force that caused the damage to the homes. My guess is that he truck was barrelling down the Ave and never saw the wires or just assumed he would clear them. I bet the driver couldn't even tell you the height of his truck. Slow down big guys, we have kids walking and playing in the streets. Con Ed, Verizon or anyother agency or company did not cause this damage, YES they were slow to responding to make a repair but the wire(s) were up at least 20 feet in the air, they weren't sparking, so they were of no danger to any person or car. Blame the right people. All three are responsible for the damage but the driver less so. If he didn't cause it, someone else eventually would have based on Con Edison and Verison's combined and primary negligence. What are the chances that our representatives will follow-up to make sure they clarify pole and wire maintenance responsibility for future reference? No you are wrong the driver of the truck was not barreling down noel ave as a matter of fact my neighbor saw him and held is hand up to stop. If he had been going fast Gods know what would have happened. Do you know how low that wire had been? A small dump truck could pulled it down and yes it is con ed and verizon because they put the wire their and after many phone calls telling them it is their responsible to move the wire up more. Should all the truck drivers get out and move the wire themselves? Come on he didn't put the wire there. If you didn't see how low if was then don't blame the truck driver. wires were not were at 20 feet!!!! bs They ignored it blame and simple. And at that time they should have told us its Verizon's pole they should have notified verizon that their was a very low telephone line connected to a pole with electricial lines but according to Verizon its a shared pole so I say they SHARE the blame! With all the money Con Ed is getting this summer from our high bills, they should take better care of those electrical wires. Have you called anyone about those wires? It’s obvious the folks above were calling and nothing was done but at least they were calling and it’s on record. I’m not saying you didn’t, I’m just asking. The first thing a city agency or politician will try to do is say – "there's no record of a compliant". City agencies, politicians, any organizations for that matter, will pay more attention to the communities most involved, who are VOCAL, who vote, who complain, who contribute. This particular problem is very dangerous; I believe this issue came up before about who owns responsibility for those poles. It's up to our representatives to MAKE Verizon and Con Ed straighten this out, now who’s going to send an email or make a phone call to their representative? ***sound of crickets*** Will this even be on the agenda at the GBPOA meeting? Will it be followed-up if it is? We demand an answer as to why we were ignored but will we demand anything?? A slew of other issues just fall off the table at those meetings. I’m not knocking GBPOA, it’s one of the only forums we have so I’m grateful that they’re trying – they don’t exactly make themselves known or available however. Other neighborhoods are pristine due to quick City agency response because as soon as an issue arises they mobilize at Synagogue or Churches, sign petitions, email politicians, invite them to functions, contribute to the precinct organizations, etc. They hold the City’s feet to the fire, whether it be via threats of a lawsuit, News12, group vote, whatever. Here we’re lucky if ten people show up for a monthly GBPOA meeting, have infighting, have defeatist post about how we shouldn’t bother calling 311, and people who would die at the thought of having even a neighborhood paper or television crew address our issues for fear of ‘outsiders’ learning about us. I think we need to re-think how we “do business” with our local politicians. And maybe people can start suggesting how. For starters I would suggest a beefed up neighborhood paper that won’t be afraid to publish the problems, and state things like “we haven’t heard a peep from congressman —, councilman —, senator — etc.” to make sure everyone is aware of it as they drink their Sunday morning coffee. Also maybe publishing a score card or items addressed vs. not addressed. Also maybe really covering the opposition running for office. I would also suggest our neighborhood organizations think about asking for monthly subscriptions from residents to raise more money – money for hiring kids for community work giving them a sense of pride for the neighborhood, or buying insurance or tools for community work, or buying influence from other organizations if necessary and legal ;-). I don’t recall seeing any ads for GBPOA posted in neighborhood businesses. Do they even have a membership fee? Who knows? Anyway – that’s my rant. These politician all read this web site!!!! i thought verizon went wireless? And the Mets won the World Series! 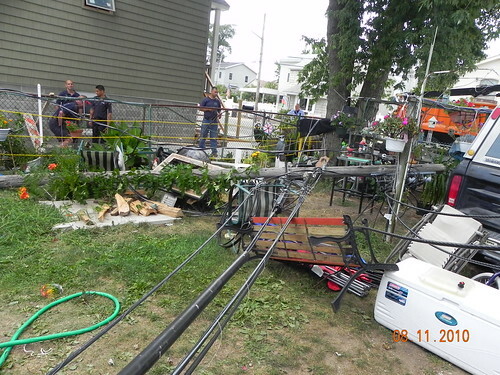 By the way this happened Wednesday pole is up not straight but wires are still down laying across yard and fences. Its unbelieve! It was Con Edisons responsibility to secure the pole in an upright position until it could be fixed in a more permanant manor. 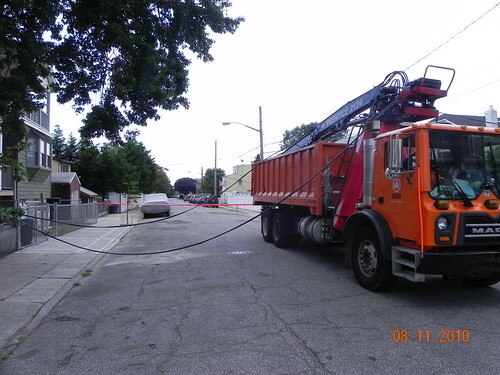 As their vehicles are insulate and Verizons are not, Verizon would not have been able to put a truck up high enough on the pole as to straighten it out. Then it would have been the pole owners responsibility to set a new pole (ie; Con Edison or Verizon as they are joint use poles with CE owning 70% of poles in their district and VZ 40%). Then Con Ed would need to transfer their plant, cable tV next and then Verizon. The damage IS the drivers fault as he apparently was not in total control of his vehicle and not (apparently) aware of his height or watching for low wires. I drive a truck for a living and just like if your front end hits something, same goes for vehicle height!